Dog lovers unite! Chewy carries all you need for your lovable pup all available at the click of a mouse. Spoil your puppy with only the best in dog supplies for dog food, dog treats and dog toys. If you've been searching for veggie flavor dog prescription food, look no further. 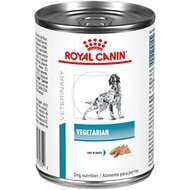 Among the wide selection we carry, one option to try is Royal Canin Veterinary Diet Vegetarian Formula Dry Dog Food. Key benefit: canine Vegetarian is a complete and balanced, selected protein dry food diet for dogs that is formulated for dogs with food sensitivities resulting in dermatologic or gastrointestinal signs. 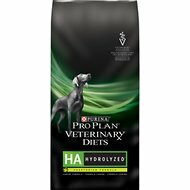 Another product is Hill's Prescription Diet k/d Kidney Care + Mobility Care with Chicken and Vegetable Stew Canned Dog Food. Key benefit: enriched with antioxidants, glucosamine, chondroitin sulfate, and therapeutic levels of the omega-3 fatty acids EPA and DHA. Chewy carries a wide selection of dog supplies to cater to your dog's wants and needs. You'll only find best in product for dog food, dog treats, and other dog supplies! For all your pet needs including veggie flavor dog prescription food, Chewy has you covered! We're here for you.